Monday morning started early for the BFY Production Crew and riders. We all rallied to the North end of Lake Washington to put the boats in the water and to film a few sets with each rider. First up was Randall Harris. This was my first opportunity to see Randall ride in person. I’ve never seen anything like it. His riding is so unique to our sport. Even though the water was already blown out and chopped up, “The Vandall” was charging the huge wake that Kilgus’s BFY Productions Malibu ramped up even in the blown out conditions. Every rider and BFY Production crew member was yelling out praises to Randall throughout his set. Next up was Jeff McKee. We drove to Juanita Bay, but there was no good water lines. We then made our way to Maydenbauer Bay and the North end of Mercer Island for his set. 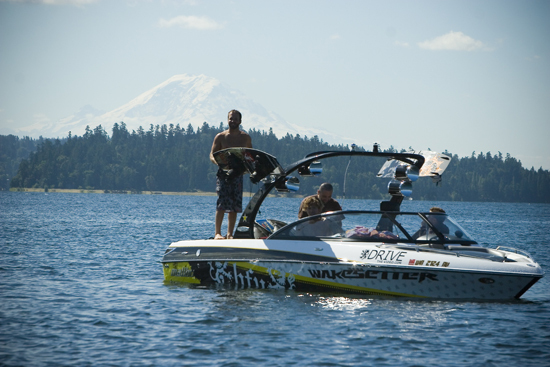 McKee put together a ride that impressed his peers even in the unpredictable chop of Lake Washington. He finished his set with a few laps near the I-90 bridge. Ben Greenwood was the last rider to take a run. For any driver that was traveling along the I-90 bridge at that time they were in for a treat. At this point, we had attracted a few onlooking spectators that just camped out in their Malibu Boats a distance away but still chased us as we ran the gut on the south end of the bridge. Once we finished up a few quick morning sets on Lake Washington it was time to pack the rigs back at Kilgus’s house and venture out to the Northeast part of Washington state. We will be traveling out East for the next few days so stay posted and check WakeboardNorthwest.com for daily recaps and further filming coverage of “DRIVE”. Featuring Riders Ben Greenwood, Randall Harris, Jeff McKee, and the BFY Production crew. Man, you if you guys end up around lake Entiat next week you should let me know. That would be the super rad to watch those guys ride in person. I’ve been blessed to watch him get back to riding since day 1 back on the water, and I’d say, he’s at the top of his game. I am editing his part for Transgression right now, so I feel like I am hanging out with him also. Ronn: I know I speak for Bryan as well as myself when I say that I have never been so anxious for the release of a Wake film. So excited to see it finished. Randall is so unreal with his riding…good to see his return and progression both on and even moreso off of the water. 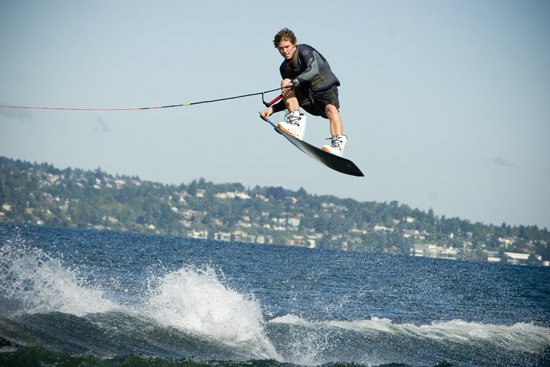 Let us know what the Wakeboard Northwest Team can do to help promote Transgression. Nick - We are a few hours North of Entiat. Wish you could have been able to see this riding in person…… It has been an UNREAL experience. DRIVE, the NEW BFY Video, is going to be amazing… flat out… Kilgus’s best work. Ronn - Good to see you on the site. Watching Randall ride has been a privilege. He is at the “top of his game”. Thank you for taking the time to catch up over the phone a few weeks back…. the call provoked a lot of anticipation for this filming trip w/ Randall. I am still in awe of the riding I’ve witnessed from Mckee, Benny-G, and Randall. Can’t wait for TRANSGRESSION. I watch the teaser a few times of day….. As Zack said, let us know what we can do to help promote Transgression and a potential premiere of the film in Seattle. Thank you everyone for your continued support of WakeboardNorthwest. Sounds like the riding thus far in the trip has been unreal. I love the fact that not one of the pictures you posted is of an invert, they’re just all big, stylie spins. I can’t wait to see the rest of the shots, and the footage that you guys get. Also, isn’t “Drive” already the name of a skate show on Fuel TV??? Kilgus. You da man. Can’t wait to see some footage! Keep up the good work. Chad you still kickin’? How is the Knee? … oh, and you spelled my name incorrectly…what is that all about? Ha Ha! Sorry about that Zack. You’d think I’d get it right considering it was already spelled on the same page. I am kickin…well with my left leg. I am 3 weeks into PT for my knee and it’s pretty slow and painful. Ah well…I am sure I will get through it soon enough! Zack, you would think that a guy with a aeronautical engineering degree could spell ZACK, damn Chad. What up bro, hope your knee getting better. LOL! Hey Randy, Thanks for calling me out in front of the millions of people that surf the site. At least you didn’t mention what company I work for, then I’d really be shamed. The knee is getting there, but taking forever. It sure has been a strange summer withotu being on the lake everyday….. I can give them a hint Chad… A very large airplane manufacturer located in the Northwest…. Guys that looks like an amazing shoot! Keep up all the good work. I’m glad to see so many updated stories so often.